You will face adversity — it’s only a matter of time. In fact, chances are, you’ve already experienced hardship. The question then, and going forward, is how you persevere through the oppressing moments of life? This goes for everyone, but the question for pastors is even more difficult. It’s not just how you persevere through adversity, but how do you preach through it? Charles Spurgeon once said of pastoral ministry, “Ours is more than mental work — it is heart work, the labour of our inmost soul.” But how do you continue to minister when your heart is under siege? How do you export the grace of God into the lives of others when your own heart is ready to fall? These questions are of timeless importance to pastors. It’s never been easy to preach the great and glorious truths of God when the atmosphere in which you preach is not great and glorious. Drawing on the life and work of Spurgeon, John Piper delivered a message on this topic to a group of pastors twenty years ago. 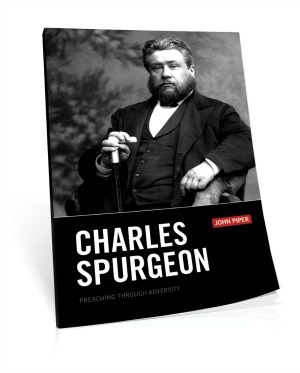 We recently edited that message into a more readable format, and release it to you as the small book, Charles Spurgeon: Preaching Through Adversity. In this book, Piper presents an inspiring vision of gospel ministry and offers practical counsel for how pastors keep going when the times are toughest. Download the EPUB file (formatted for readers like the Nook, Sony Reader, and Apple iPad, iPhone, and iPod). In addition to the digital copies, we are also releasing a print version of the biography available for purchase through Amazon. This option aims to make Piper’s enduring counsel more accessible to pastors and ministry leaders in a handy paperback.